It’s all change in Dublin city. 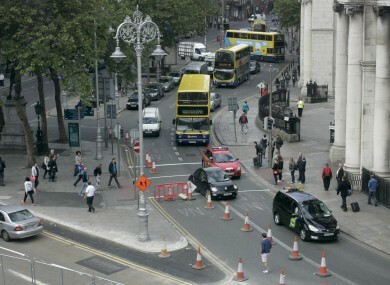 CARS LOOK SET to be banned from Dublin city centre under radical new plans being put forward by Dublin City Council and the National Transport Authority. College Green and the north and south quays will only be allowed to be used by public transport, cyclists and pedestrians, while Suffolk Street and St Stephen’s Green North will be pedestrianised under the proposals. The space in front of Trinity College will become a civic space, with cars, vans and taxis completely banned from the area around College Green. The major changes are outlined in the Dublin City Centre Transport Study which is published today. The council and the NTA say that traffic congestion levels in Dublin are already rising and plans are needed now to make sure that the capital city can deal with the amount of people travelling to and from it every day. The Dublin City Development Plan has set a target for 55% of travellers to and from the city centre to use public transport, 15% to cycle, 10% to walk and 20% to use private cars by 2017. The plan will also see Westmoreland Street given wider paths and enhanced cycling facilities, while D’Olier Street will get a new central median with additional bus stops and segregated cycle lanes. “Dublin City Council and the NTA are making these proposals because we cannot meet the expected growth in commuter traffic over the next decade through more car journeys,” said Owen Keegan, the chief executive of Dublin City council. “The city centre can only continue to function effectively if we offer those working and living in Dublin, as well as visitors, more choices in how they access and move around the capital”. Members of the public have from tomorrow until 16 July to give their views on the plans before final decisions are made. Email “Cars are going to be banned from large parts of Dublin city centre, says council”. Feedback on “Cars are going to be banned from large parts of Dublin city centre, says council”.